Halloween is only a few days away and I really could use more time to enjoy the Autumn season. It seems to have gone way to fast this year...but I think I say that every year. It's so much fun to see all the different color combo's...thanks for sharing with me! And now, the winner of the Halloween book is Kristin K! Kristin, please email me your snail mail address and I will pop your book in the mail to you. Thanks for joining me for Mystery #6. We will be starting a new Mystery soon. Mystery Monday #6....this is it! Today we finish up Mystery #6! I can't believe we have already done 6 Mystery's. Where does the time go? I hope you have enjoyed this fall Mystery as much as I have. Click here to download MysteryMondays #6 Part 11. I will post my finish wall hanging soon. Just didn't get a chance to sew this past weekend so I am a little behind but I will share it soon.Send me a picture of your finished projects...I would love to see it! I am thinking the black for the inner border and the orange strip for the outer....still now sure. Click here to download MysteryMondays #6 Part 10. Some people have shared with me their progress so I thought I should share with you too. Great job ladies! I love to see the work that you all do. Hope more of you will share with me too. Big oops here....it's Wednesday and I am just posting the Mystery clue. I had it on auto posted and it didn't work and I didn't check it....so sorry about that! This week we are putting it all together! There is a bit of sashing to sew up and you will be adding to one of the sashing pieces that you have already sewn to make it a bit longer. Click here to Download MysteryMondays #6 Part 9. Would love to see how you are doing on yours! Next week we add some borders. It's the start of a new week and some more sewing. Have you been keeping up? This week we are doing 2 acorn blocks. I love acorns! I think they are little treasure we find the fall. This past weekend my family and I went camping with some really good friends and had a wonderful time. There is nothing better than waking up early and going for a walk as the sun comes up, which is what my hubby, son and I did together. While on our walk, my son picked up acorns for me because he know how much I love them. How cute are they! I know....it's probably weird but I really like them. This week you will be sewing up your own acorns. Click here to download Mystery Mondays #6 Part 8. P.S. Be sure to follow me on Instagram to see what else I am up to. I know this is a day late but I figured that you, like me, were spending time with family and friends yesterday trying to have a bit more fun before school started today. We have a couple of cute little blocks to do today. I fussy cut the centers from some of my favorite halloween fabric. I think I picked this up a year or two ago at Rosebud's Cottage. She always has the cutest vintage fabrics. I even made a pilllow case for my self with a crocheted edge out of this fabric. When I pull it out of the closet I will share it with you. Click here to download Mystery Mondays #6 Part 7. Hope you had a wonderful Labor day weekend. The weather was wonderful here on Sunday and we spent the day at the Minnesota State Fair. I guess it was a record day with the highest attendance in 150 years...yes we were there and it was crazy! But I got to eat alot of great food and enjoyed the day with my family...what can be better than that. P.S. If you are missing a clue, just go to the blog (if you get this by email, just click on the title and it will take you there) and all the clues are there and will stay there for you to download anytime. P.S.S. If you can't download the clue, be sure you have the latest Adobe reader installed on your computer. It's a sunny Monday here and boy is it hot! I will have to remember this day in a few months when the snow is coming down and it's cold outside instead of a heat index of 110 degrees. We are now up to part #6 of our Mystery. I am taking it kind of slow right now because I think alot of you, like me, are getting your kids ready for school and the summer is coming to an end soon. Click here to download MysteryMondays #6 Part 6. A few more weeks of sewing and it will be ready to hang up for fall. Mystery Mondays #6....part 5 today! I am back from vacation and feel like a chicken without it's head...running around with way too much to do. I think it's the end of the summer panic setting in. Sad summer is almost over and I don't feel like I got enough done or had enough time. School is fast approaching and that makes me sad too. A good thing about the end of summer is the Minnesota State fair that we will be heading to next week. This year I designed a special pattern for Rosebud's Cottage. She has a WONDERFUL booth at the fair and will be handing out the pattern there but you need a coupon that you receive when you are signed up for her newsletter. You do need the coupon and there is a limited amount of patterns so hop on over to her site, sign up and get to the fair...hope to you see you there! So after all that...I have the clue for you but I wasn't able to sew mine up to share with you. I will post it as soon as I get it done. Click here to download MysteryMondays #6 Part 5. So how is it going? Have you been keeping up with the sewing? I have had several people share with me pictures of their blocks...thank you! Great job everyone! I just love seeing all the fabrics people pick for their projects. Sew up your blocks but don't sew them together...we will be doing that later. Click here to download MysteryMondays #6 Part 4. I would love to see how your leaves turn out if you would like to share a picture. Now for a little FYI....I am leaving today with my mom for a Mother/Daughter vacation to celebrate her big birthday this year. I will be back next week but I will not be here to post a new clue to the Mystery. So you will have two weeks to sew up your leaves and catch up on any other clues that you need to finish. Enjoy! We have had some wonderful weather here the last few days and I am loving it! It almost feels like fall. I love it when you can have the windows open and the fireplace on...perfect sweater shirt weather. Hope it will last a few more days...we will see. 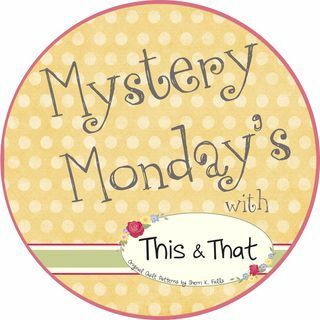 It's time for part #3 of our fall Mystery so click here to download Mystery Mondays #6 Part 3. I would love to see how your Mystery is turning out. Great job Judy and thanks for sharing them with me!